Some of you may have read a post on the NJBirds listserv about the Philly Bird Nerds this weekend. Have no fear, we don't need bail money! We spent the morning with our friend Harvey starting out at Cox Hall Creek, grabbing breakfast at Sunset Grill so that we could eat and watch the bay at the same time. 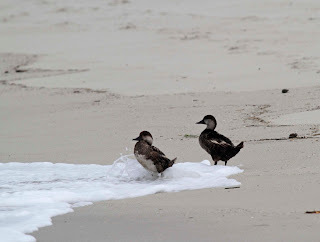 I noticed a pair of ducks that looked like Scoters bobbing around one of the jetties, so we drove up to get a better look after downing the last of our breakfast sandwiches. 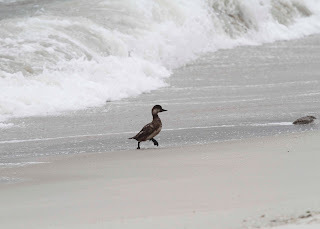 Scoters in Cape May in June is weird. 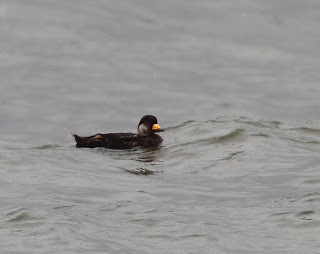 Black Scoters are the most common scoter that is found around our area but mostly from October through April when they take off for northern breeding grounds. The first 2 that we saw were a male and female. It got really interesting when we got out to the beach and saw 3 more scoters - which we thought were all juveniles. These birds almost looked like they could be White-winged Scoters because they had a white strip on the wing. 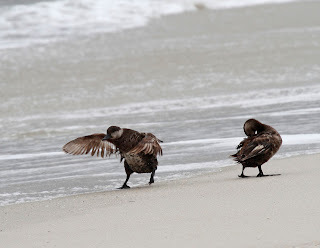 Closer examination showed that the white wing strip was actually molting feathers. Thanks to Rick Wright and Harvey for setting me straight on this. Things got really interesting when 2 of the birds started getting closer to the beach and then popped out of the water. 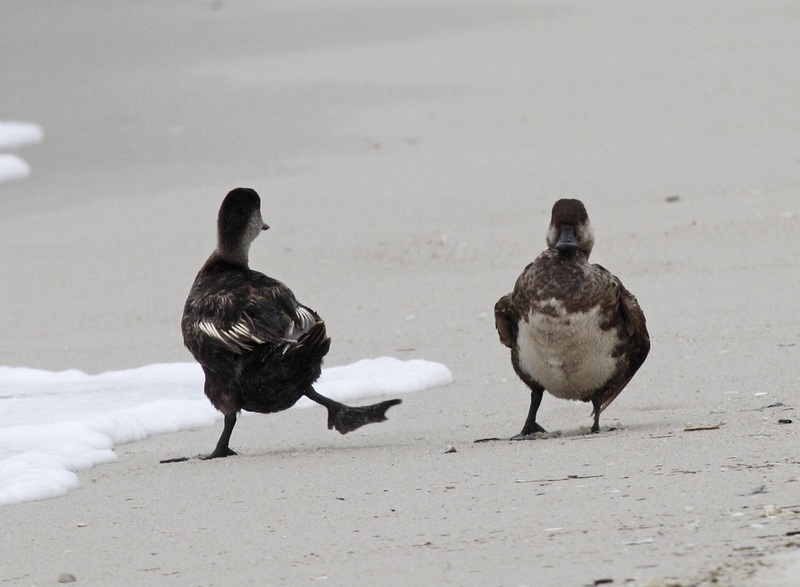 Scoters are sea ducks and not regularly found on land - hence they look kind of awkward. You can see by the next photo that these birds are unable to fly. Look at those ratty wings! These 2 stayed on the beach for a good 15 minutes waddling, preening and generally taking in the scene before finally heading back out to join the rest of the family. I couldn't resist this shot. That's Harvey photographing the same scoters. 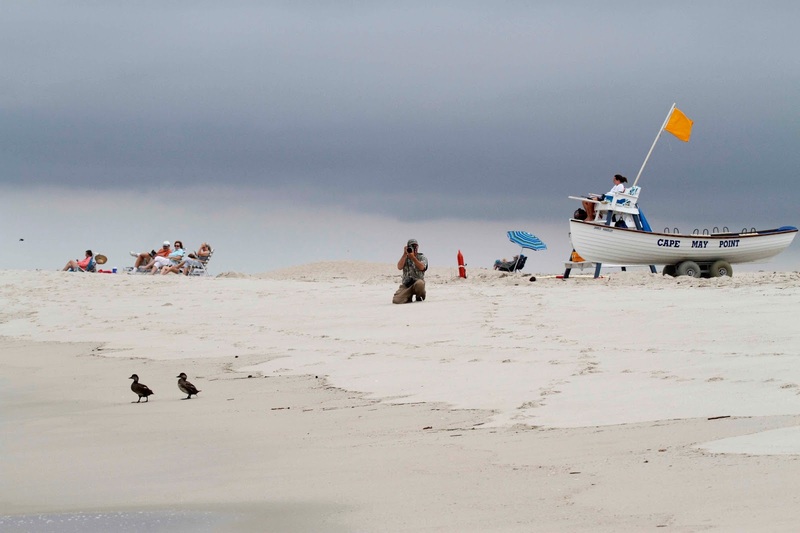 You can see that these birds didn't really care about being close to human activity - that's the Cape May Point life guard and some other brave beach-goers in the background too. You can also see why these photos aren't that great. It was threatening rain the entire time we were on the beach. Harvey did some research on the birds and found out that they don't nest until later in the season which means that all of our birds were adults - born at least last summer. So, why are these 5 birds hanging around Cape May in June when they should be up in northern Quebec or Labrador Canada? Could it be that they are only first-year birds? Probably, since they don't breed until they are at least 2 years old. I still think its weird that they are hanging around NJ. Harvey told me that there are only a dozen reports of scoters in NJ over the past 13 years so it isn't THAT common. Great photos. I love the dark and stormy shot. 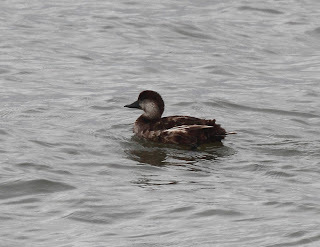 Linda- -we agree Scoters in June are unusual. Here in RI we seen black, surf, and white-winged scoters in mid to late August. Also see the King and Common Eider here in November . 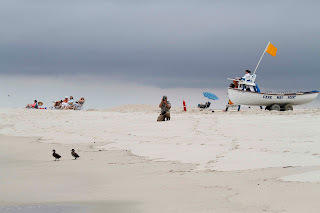 Are you impressed by our bird watching for amatuers? We bet your Mother would be! Ha - you are all becoming real experts!